Emergency light is an integral part of household electronics nowadays. We all know Emergency light is used during the power failure to light up the home. As it is used during the power failure, it should last long, hence generally bright white LEDs are used in emergency light, because they produce more light and consume less power. Emergency light is very useful and popular project in DIY section. So today we are going to build a simple and cost effective emergency light. In this emergency light circuit, when the Power goes OFF, the emergency light activates automatically. We have used four bright white LEDs, more LEDs can be added to produce more light considering that total current consumption should not exceed the supply current. Ultra bright white LED consumes 3v and 20mA current. We can divide this LED emergency light circuit into two parts; first part is used to drop down the 220v AC voltage into 8v regulated DC, with the help of Transformer and bridge rectifier. And second part consists of Relay and rechargeable battery, which is used to lighten the LEDs during power failure. The second part of the emergency light circuit consist the main functionality, that is to automatically switch ON the emergency light (Array of white LEDs) on Power Failure. We have used Relay here to automate this. A 6v, 4.5Ah rechargeable battery is connected to the Array of LEDs, through a Relay. Normally when there is no power failure, the coil of Relay remains energised and lever is attracted towards the NO (normally open) terminal and NC (normally connected) terminal remains open. In this situation LEDs are disconnected from the rechargeable battery and remains OFF, also battery is getting charge through the power supply from the transformer. A diode D5 is used to prevent the battery from flowing back. Now when the power fails, relay coil become de-energized and lever gets connected to NC terminal, which connects the LEDs to the rechargeable battery, and LEDs array goes ON. This is how this emergency light works. Now when the power is restored back, relay gets activated and lever again connects to NO terminal which in turn disconnects the LEDs from the battery and connects battery to the transformer for charging. Generally 6v, 4.5Ah rechargeable battery comes with Deep discharge recovery and overcharge protection mechanism, but we can use zener diode of 6.8v to protect the battery from overcharging. We can also use other rechargeable batteries like Nickel-cadmium battery (NiCad), Nickel–metal hydride battery, cell phone batteries etc. Further we can also use PNP transistor BD140 in place of Relay. PNP transistor can be used here as a switch, like it will be OFF when continuously voltage is applied to base of it, in case when power is there and it will be ON, in case of power failure which connects the LEDs to the rechargeable battery, and activates the LED emergency light. 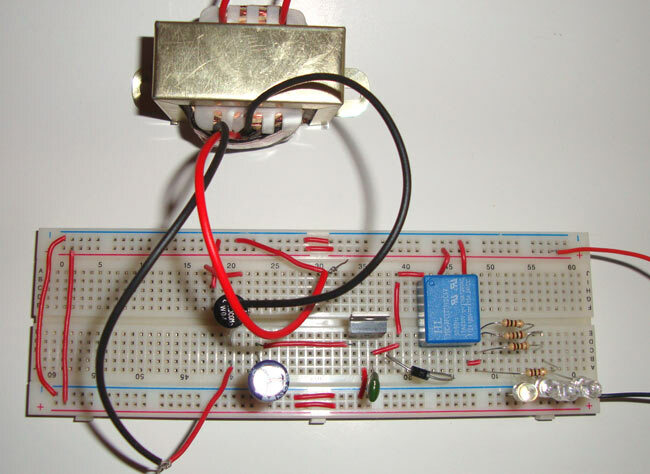 This emergency light can also be made using LDR (light dependent resistor), in which light will automatically switch ON according to darkness, means it remains switch OFF in presence of light and switch ON in absence of light. Projects are very nice. these are practically applicable for human society.. Thanks for the diagram on how a cell phone charger circuit works. A friend of mine likes to make things like this out of spare parts around our house. We haven't been able to figure out how he does it, but it works every time. Thanks for sharing! I have a 21 LED rechargeable lamp.but now the battery didn't holds the charge. How can i work it with out using the battery,by giving ac current continuously..
Use 5v, 500mA-1A AC Adapter. could you use 3 AAA rechargeable batteries in series instead of the 6v that you used for this project? You can use 4 AA rechargeable batteries. You can use C9014 here but BC series is not eliminated. Yes you may need bigger battery to glow powerful LED, remaining circuit remains the same. In the article you said that we can use pnp BD140 transistor in place of relay. I want to know why BD140 only. Can we also use BD136 or BD138.